In hindsight I should have recognized this as a fiendish plot to derail our summer day, but as they say hindsight is 20/20. The other day, Tati, my older daughter was craving Muddy Buddies. Hey, aren't Muddy Buddies for Christmas? I agreed we could make them, not realizing her motivation behind the plot. Of course we didn't have the ingredients on hand and had to go to the grocery store. Then, we came home to make the Muddy Buddies -- that was the end of productivity for the day. Chores that weren't done, didn't get done. I should have followed the famous maxim "Work Before Play." That's how my summer days are sometimes. How about yours? 1 cup milk chocolate chips (We are politically incorrect -- we don't like semi-sweet chocolate chips ;). We quickly bagged up some to give away. 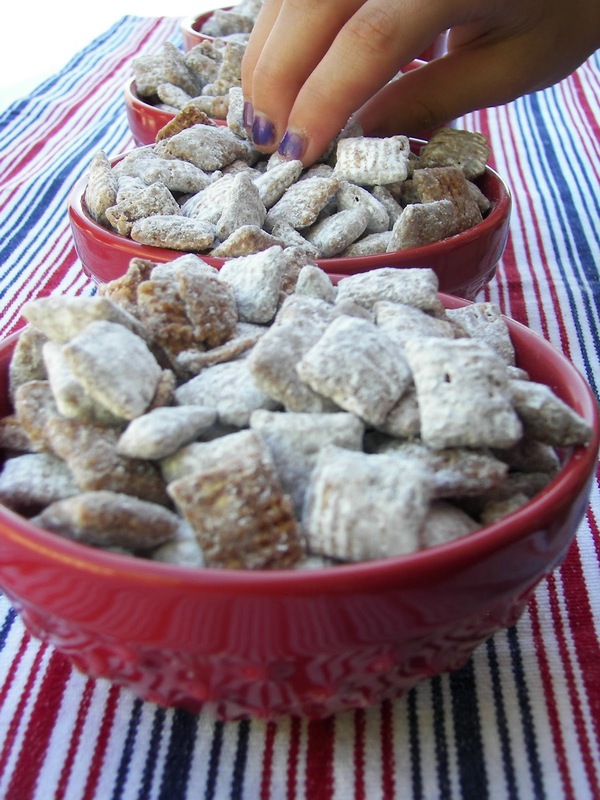 Do you know that some people have never eaten Muddy Buddies? We are talking about you Danielle -- we were glad to introduce them to you. Thanks for dropping by (drooping too if you are tired) my Red Couch where you are always welcome to come and sit a spell. 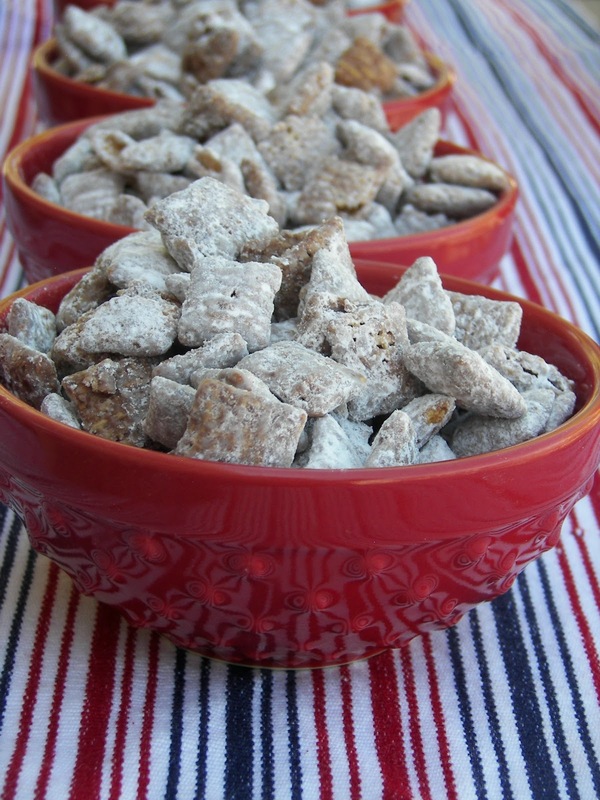 I just had this for the first time this weekend - except Iwas told it was caled puppy chow -I like Muddy Buddies better. I am not sure if I have had this either! But I Will try it!! Looks good! We call it puppy chow, too. I love it, but I've never made it myself. A friend used to bring it to my girls. Now, I can use your recipe and try it. I love the way it looks in the festive bag! I think it's an any time treat. Yum! I have to confess my chore train is easily derailed on a regular basis. Be sure to stop by my blog this week to enter my giveaway. Sounds like a treat we need to try. I think maybe I've had it disguised under a different name. Thanks for sharing your recipe Joni and thanks Tati for your summer time request! I have never even heard of this - but it sounds like my kind of treat! Just stopping by to let you know that I featured your firework cookies on my blog. I absolutely LOVE the way they look! Super cool!! This is one of my kid's favorite treats. Around our house it was called "Puppy Chow" and I haven't made it in ages because I literally can eat myself sick on this stuff! Sometimes it is worth not getting things done...time with our kids is precious! I'm one of those people who has never heard of this snack. This is just the type of thing I love to munch on. I bet my grandkids will love it too. Thanks for this excellent idea, Joni. I'm seeing this in my Christmas baskets. I am embarrassed to admit that I have not had Muddy Buddies either!! Now that I have crawled out from under my rock, I will be trying them. They sound delicious! Thanks! Delicious! 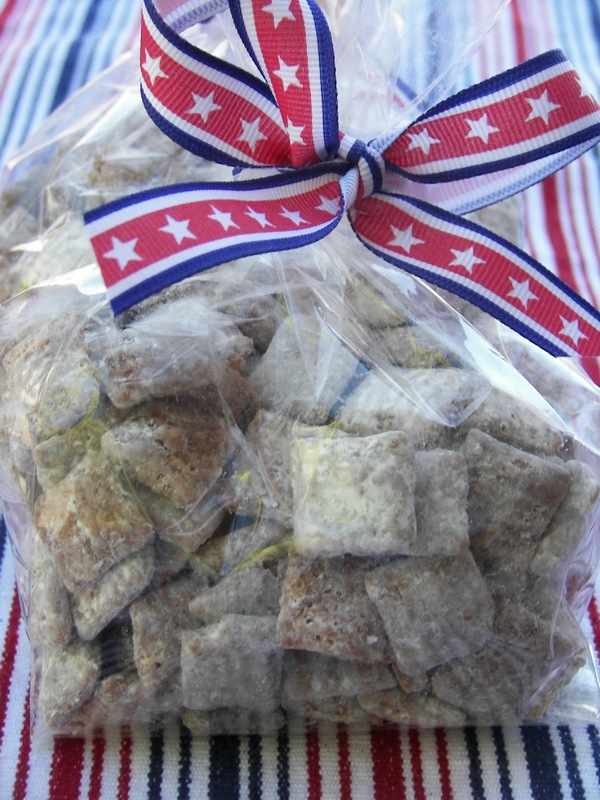 We always called this Puppy Chow. My son loves them. This is by far one of my favorite recipes. We always use dark chocolate chips.